Download (Current Version: 1.3) Updated 12/15/13! NOTE: You must use Slipstream to install 1.3. The update makes use of some of the "advanced" insertion tags SMM enables, and trying to use GMM will result in errors. The older GMM-compatible v1.2.2 will remain available however. The README file is now tucked into the .FTL itself. GMM will give an error message about it while installing the mod, but all mod contents will install properly. -Singularity Projector. Creates a black hole at the targeted point, dealing heavy damage to systems, personnel, ship structure, and causes a hull breach. -Pulse Disruptor Mk. I Higher charge time and energy cost than the Burst Laser Mk II, but can pierce one layer of shielding. Also, have a look at "The Journey of the Reaper" by Captain Rhonos, based on this mod. For a continuation of the story-blurb at top, see"Retribution"
Comments and constructive criticism are always welcome, trolls will be jettisoned from the airlock. Last edited by Kieve on Tue Nov 27, 2012 5:29 am, edited 16 times in total. I like the looks of this idea so far and just have one question. Will you be able to use the "gravity-well" from the beginning of the game? If not, what other weapons will you start with? Other than that, looking forward to the completion of this mod (and not just because engi B is my least favorite ship I've unlocked so far ). HelloLion wrote: I like the looks of this idea so far and just have one question. HelloLion wrote: Weapons level IV is a huge boon, so and considering the other capabilities of the ship I'd say it shouldn't start with any other weapons. Maybe... on the one hand, shields + cloak gives ample time for charging it, and there's Crystal Vengeance for when an enemy missile slips by. On the other hand, Breach might open the hull and require repairs, but it's still going to take a long time to bring down your first few enemies if it's the only weapon you've got (and, knowing the way RNG rolls, it might end up being your only wep for a long while). Guess that's a question to be answered by some playtesting through, once it's ready. The thing that bugs me most is the lack of sensors. I hate not being able to see in my own ship. That's beautiful, great job. Can't wait for this to be released. A final update for tonight. Reworked the look of the crystal bits. 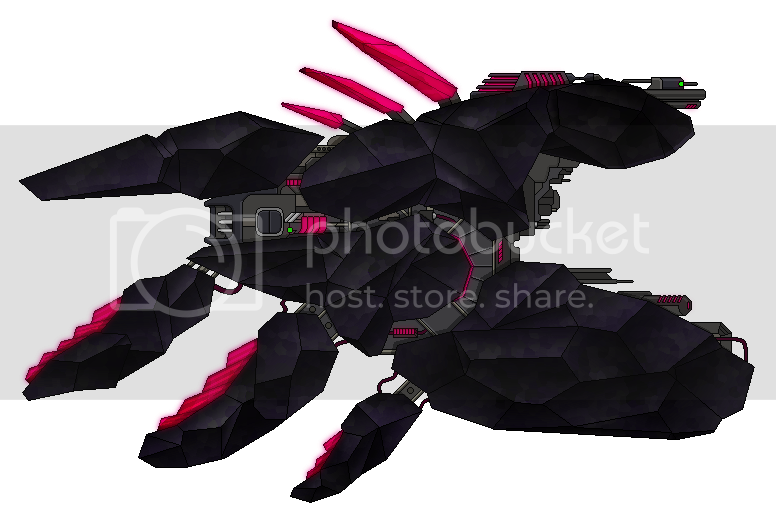 For the first, I was using an embossed layer to mimic the Crystal Cruiser's structure, but I think this version works better for an "obsidian" look. The flat-color hull sections may look strange because I'm layering the "gib" sections on top of each other to ensure they match up correctly - two of them are complete so far. Grognak wrote: That's beautiful, great job. Can't wait for this to be released. Looks great, can't wait until you've finished! I always have this great idea to post about when reading a thread, but I always seem to loose the subject while writing a reply, and end up not saying anything at all. I should sleep more. Is that a cookie? I stayed up a lot longer than I should've, playing with the Singularity Projector spritework. Got a prototype of the "explosion" part of the bomb done. Will probably go back and tweak this a lot, but for now it seems functional. The weapon itself may be another story - something I'm noticing is how small all the weapons look in comparison to the ship itself. I probably should've thought of that before going in and coloring the linework... as it stands the ship-mounted weapon sprite for the launcher will probably end up being similarly huge, compared to other weapon sprites. 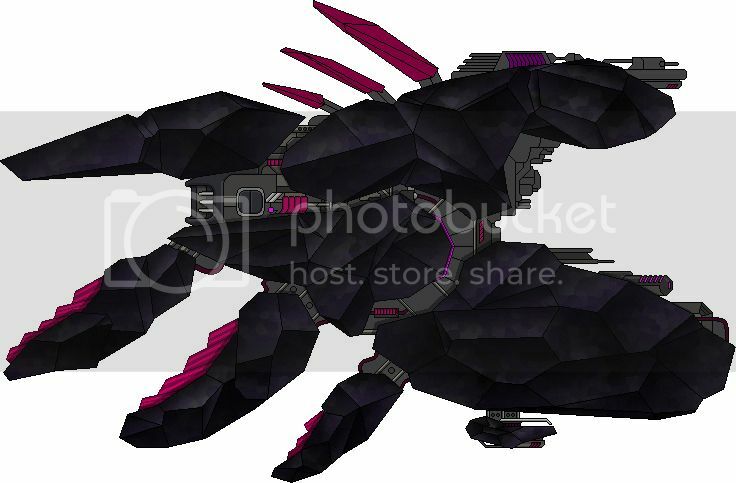 Will set "rarity" to zero on it to prevent it from cropping up in stores or on enemy ships. 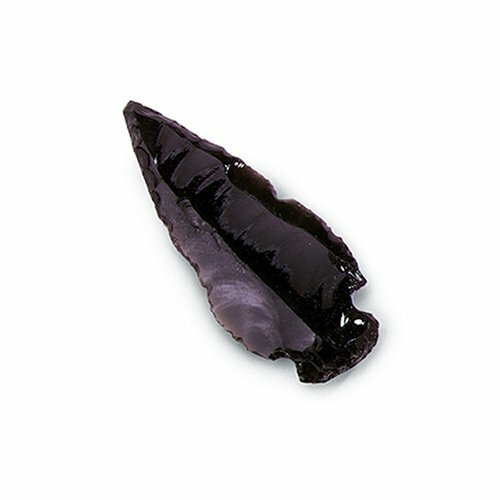 Similar to the crystal guns, it'll only really look "correct" on the Obsidian. Progress for tonight - making some headway. 4/6 gib sections finished, working out the kinks as I go along. Note the new addition on the bottom pylon - the prototype design for the Singularity Projector. 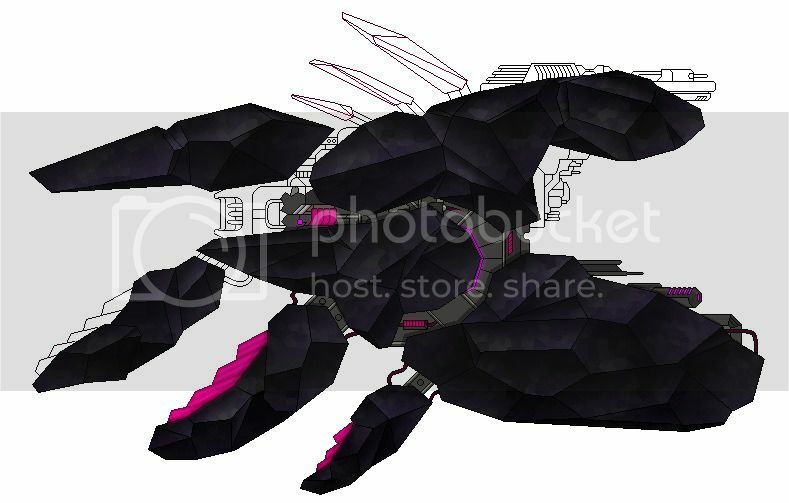 I'm a little worried how low it'll ride on the screen, given how large the ship is, so it may end up being repositioned. EDIT: Note that I'm showing it "fully extended" for display purposes. Retracted, it should fit snugly against the hull. Flat colors on the upper-right sections for now because it was easy to do, still have to "gib" them and do some shading and hue variation. Still on track for a Friday release, I think, though I may call it a "beta" and let you folks help me hammer out the kinks. TGIF right? Thoughts, comments, and constructive criticisms are of course always welcome!